It may be a hard-to-swallow truth for Naresh Goyal, but investors are jubilant about his exit from Jet Airways—the Mumbai-based private airline he has run for 27 years. 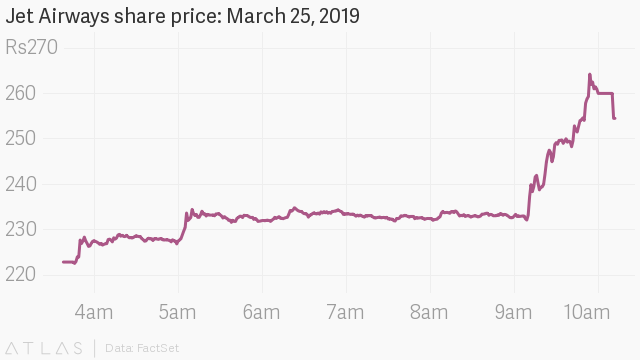 On March 25, minutes after Goyal announced he is stepping down from the board of the company, Jet’s market capitalisation on BSE rose by nearly $47 million (Rs320 crore). Goyal’s unceremonious exit marks the end of a chapter in Jet’s history, but it hasn’t been smooth sailing. Known to be an extremely hands-on promoter (Goyal even cleaned toilets in Jet aircraft to lead by example), giving up control has not been easy. While Abu Dhabi-based Etihad Airways, a minority partner, wanted Goyal to step down months ago, the latter had been resisting. The airline’s lenders, led by the State Bank of India (SBI), also echoed the sentiment and said they wanted to replace Goyal in order to pull the company from the brink of bankruptcy. Jet’s condition is so dire that only 41 of its 119 planes have been flying; the rest are grounded as lessors moved to repossess them over unpaid dues. Now the consortium of banks led by SBI, which has taken control, is going to focus on roping in a new promoter to salvage the airline, kindling hope among investors. 1949: Born into a wealthy family of jewellers in Punjab whose business goes bankrupt while Goyal’s in his teens. He grows up mired in financial constraints. 1967: After completing his bachelor’s degree in commerce, he joins his uncle’s travel agency as a cashier for a wage of Rs2,300 per month. 1969: Becomes the public relations manager of Iraqi Airways. 1971-74: Serves in Royal Jordanian Airlines as a regional manager. 1974: Smitten by the startup bug, Goyal borrows money from his mother to launch a travel agency—Jetair. In the next few years, his firm goes on to represent Air France, Austrian Airlines, and Cathay Pacific in sales and marketing. 1991: Indian skies open up to private airlines and Goyal wants to be the first to launch an aviation company post-liberalisation. 1993: Jet Airways commences operations. A year earlier, another private airline, East-West Airlines, was launched. 1995: The founder of East-West is shot dead and the airline collapses. This clears the way for Jet Airways to take a bigger share of the market as Goyal models the airline based on global carriers. 2000: Questions are raised about Goyal’s link with the underworld, which he vehemently denies. 2002: Indian intelligence agencies allege that Goyal got illegal funds from Gulf countries, another indication of his underworld links. 2004: Jet adds international flights to Jet Airways. 2007: Buys Air Sahara for Rs1,450 crore, reportedly against the advice of his aides; rebrands it as JetLite. Air Sahara is run as a separate business, so Jet writes off the Rs1,800 crore it put into JetLite. 2008: Jet Airways decides to lay off 800 members of its cabin crew. Following massive protests, Goyal claims he was unaware about the decision and vows to get them reinstated. 2009: Goyal’s penchant for hiring expats gets him into trouble after his Indian pilots protest over unequal treatment. 2012: The government allows foreign direct investment in Indian aviation and Goyal is believed to be instrumental in affecting the decision. Jet turns out to be one of the biggest beneficiaries of the new norms, with the company raising money by selling a 24% stake to Etihad. After struggling to run JetLite, the business is merged with JetKonnect, Jet’s no-frills brand. 2016: A book by an investigative journalist reveals that intelligence agencies had found links between the underworld don Dawood Ibrahim and Goyal in the early 2000s. 2018-2019: In the face of stiff competition from low-cost airlines, Jet Airways posts losses exceeding Rs.1,000 crore in the first two quarters of 2018-19. A weak rupee and high fuel prices drive the company, and consequently Goyal, into a financial mess. It is ironic that Jet Airways, which once wanted to step in to rescue Air India and pick up a stake in it, ended up with a market share lower than the national carrier in February, 2019. In the month, Jet’s market share had slipped behind those of IndiGo, SpiceJet, and Air India, compared to its second position at the end of December.